The famous Lorenz equations that describe the nature of chaotic systems – such as the weather – have been turned into a beautiful real-life object, by crocheting computer-generated instructions. It is not often that a serious mathematics journal contains a crochet pattern, but the current issue of the Mathematical Intelligencer has instructions on how to crochet your very own model of chaos. It looks like a large Christmas decoration. Dr Hinke Osinga and Professor Bernd Krauskopf, both in Bristol University's Department of Engineering Mathematics, have turned the famous Lorenz equations that describe the nature of chaotic systems – such as the weather or a turbulent river – into a beautiful real-life object, by crocheting computer-generated instructions. Together all the points (stitches) define a complicated surface, according to the Lorenz equations. Osinga and Krauskopf have developed a method to describe such surfaces using a computer. After months of staring at animations on a screen, they suddenly realised that in fact their computations had naturally generated crochet instructions. Osinga, who learnt to crochet at the age of seven, was ready for the challenge. “The computer-generated crochet instructions were remarkable. Simply by looking at the real-life surface I would never have designed it the way the computer did. After all those months of trying to create it on screen, it was fascinating to see the surface grow under my own hands,” she said. “And it was truly amazing to see a floppy object fall into its desired shape when it was mounted with steel wire,” Krauskopf added. The final result consisted of 25,511 crochet stitches and took Osinga about 85 hours to complete. It now hangs in their house as a Christmas decoration. But this wasn’t just done for fun. Osinga and Krauskopf’s work gives much-needed insight into how chaos arises and is organised in systems as diverse as chemical reactions, biological networks and even your kitchen mixer. 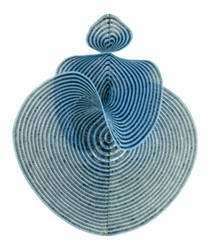 Their crocheted model, called the ‘Lorenz manifold’, is a very helpful tool for understanding and explaining the dynamics of the Lorenz system. If you would like to crochet your own Lorenz manifold in time for Christmas, the pattern and mounting instructions are available online here.